As a former Dallas resident, I loved the Dixie Chicks. As the founders of this country band, the sister duo of Emily Robinson and Martie Maguire paired memorable lyrics with impeccable harmonies. 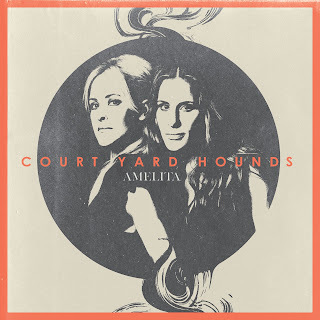 That combination is alive and well in the sisters' second album Amelita, by the Court Yard Hounds. The Amelita is a blend of heartfelt lyrics and carefully crafted music. It reminds me of the music that they played during their early Dallas days. The songs on the album range from tender, slow ballads to upbeat, fun tunes. It would be best described as folk pop. The duo pulls from their country roots, but makes music that accessible to the top 40 crowd. Personally, I think that Amelita is a good album to have playing in the background throughout the day. It doesn't overpower the listener, yet it doesn't lull you to sleep. The album would be a great accompaniment to sitting out on the patio with a glass of wine. A few of the songs dared you to get up and start moving. For example, Rock All Night is definitely an upbeat, almost dance-ish tune. If your toes aren't tapping during this song, then I would be surprised. The best part of the album is the harmonies that the two sisters produce. Their voices combined with the talented musicianship of both make for a lovely experience. If you are looking for heart and soul through music, I would recommend this album. Amelita is the second album from the duo. It was released on July 16. To purchase this album, please visit iTunes, Amazon or other retailers.